This is a list of music tracks placed in the Animal Crossing category in the Sound Test of Super Smash Bros. Brawl. Contrary to the title, this track is not merely a remix of the Title Screen Theme from Animal Crossing, but a whole medley of tracks from the game. This track includes the Title Screen Theme, Museum Theme, 3pm - 4pm Theme, Loan Paid Off Jingle, 6am - 7am Theme, Tom Nook's Store Theme and the Town Hall Theme, before looping again. The Museum Theme would play in Animal Crossing whenever a player explored Blathers's Museum, 3pm - 4pm Theme would play whenever a player was outside during the real-world time of between 3:00pm - 4:00pm, and the 6am - 7am Theme would play under the same circumstance, only the real-world time must be between 6:00 - 7:00am instead. The Loan Paid Off Jingle would play when a player paid off all his/her debt to Tom Nook, or the ATM Machine. 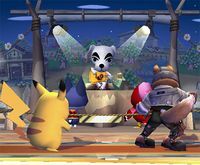 Note that much of the soundtrack was changed between the Nintendo 64 / GameCube and DS / Wii versions; in instances where the soundtrack has changed, the Wild World counterpart is used in the medley. This track debuted in Animal Crossing, where it was one of the random songs K.K. Slider could sing at the train station, and in later games at Brewster's Roost. When K.K. Slider completes his performance within the games, he would give the player a CD of the song he just played, albeit instrumental. This instrumental version is mixed in alongside the vocal version of this track. This version of the track ends with a completely new bridge. This track is an arrangement of two music pieces from the Animal Crossing series. The first is the Town Hall Theme, which would play when a player explored the Town Hall in Animal Crossing: Wild World, and the second is the Tom Nook's Store Theme, which would play when a player browsed around Nook's Cranny, Nookway or Nook & Go in any Animal Crossing game. Another shop owned by Tom Nook called Nookington's also has a remixed version of this track. In PAL versions of Brawl, this track is called Brewster's Roost, to correspond with the name of the café the track first played in. K.K. Slider performing one of these tracks. In the Animal Crossing games, Saturdays between 8:00pm and Midnight, K.K. Slider would be present in Brewster's Roost, or the train station if playing the GameCube version. Once spoken to, he would sing a random song, or a specific song via requests. All of the tracks listed above are songs from the Animal Crossing series which K.K. Slider could sing. Composition & arrangements copyright Nintendo. Most likely to support usage of the easter egg, these tracks cannot be accessed via the Sound Test, nor can they be played through any other means, with the exclusion of Rockin' K.K., which plays during Event 26: The Slow and Easy Life. "K.K. Western" notably uses the same song structure as the traditional folk song, "The House of the Rising Sun", most specifically the cover version by The Animals.